In 1986, the Martins Dias family, owners of the Quinta de Benamor property near Tavira, engaged Henry Cotton to layout the first golf course in the eastern part of the Algarve, twenty years after he established his pioneering course at Penina, in the west side of the region. Unfortunately, the three-time Open champion died the following year, way before construction got under way, but his outline plans were later taken up by architect Howard Swan, which eventually led to the opening of an 18-hole layout at the start of the new millennium. The clubhouse is located beside a disused church and perhaps it’s this old building that convinced Sir Henry, a well-known religious man, to get involved in the project in the first place. 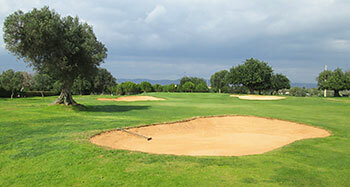 Certainly, the course’s owners are pleased nowadays to promote Benamor as a Cotton design. Fairways are bounded by combinations of almond, carob, cork and olive trees and they’re set out on gently undulating terrain which offers splendid views of the mountains to the north and the Atlantic Ocean to the south. Elevation changes may be frequent but they’re never too strenuous. The tight par five 5th is rated the toughest hole on the card, playing uphill then doglegging slightly left to the green. The par four 6th immediately following is probably the best hole on the front nine, plunging back downhill to a green that’s well defended by sand to the front left hand side. The inward half at the par three 10th begins with a heroic downhill tee shot to a pulpit green on the other side of a gully and this short hole is almost matched for dramatic value at the par three 17th, where the green is benched into a small hill, protected by a pond at the front and two enormous bunkers on either side. I love it when you play a course with zero expectation and it delivers way more than you might have reasonably anticipated beforehand. Such was the case with Benamor when I was there the other day. It reminded me on occasion of “second tier” courses back in Scotland where I enjoy playing, like Pitlochry or Auchterarder. It may be one of the lesser lights on the Algarve that will never feature at the top of any ranking chart but it’s a charming little course with a “real golf club” feel (I noticed there were 150 active members on the Tavira Golf Club noticeboard in the clubhouse) as opposed to some of the soulless big resort tracks that think nothing of charging double the green fee for half the enjoyment that you’ll experience here. My “Pocket Guide to Spain & Portugal” suggested it was just a run of the mill course with only one good hole (the par three 2nd) but the authors of that book must be really hard to please because they missed several other holes that I really admired, such as the downhill par four 6th and the treacherous short par three 10th. I liked the way the routing made good use of the sloping landscape between the 3rd and the 7th holes, even though it meant three of the fairways ran parallel to each other. I also enjoyed the little loop from hole 10 to 14, where a small parcel of land to the north of the property is brought nicely into play. Some of the fairways on the front nine were a bit narrow so accuracy off the tee was absolutely essential. Most of the greens were interestingly contoured – especially on three of the short holes, with two-tiered examples on the 2nd and 8th and a big back to front tilted effort on the 17th. I must also mention two other things. There’s a big tee box renovation going on at the 9th which looks like a continuation of the excellent work that’s been carried out at the 5th and 7th to landscape the edges of the teeing areas with wood chippings – very eco-friendly and aesthetically pleasing and it provides a wonderful contrast of texture and colour in those areas. And I doubt if there’s a more elegant practice putting area (in a separate terraced area near the 10th tee) anywhere on the Algarve – what a lovely place to warm up for a round in such a beautiful little setting. You really have to applaud Benamor for looking after the small details as they really do make such a difference.